Our product range includes a wide range of epoxy sheet. FR-4 Epoxy Sheet, also known as insulation sheet, fiberglass sheet, and Epoxy sheet, it is made of alkali-free E-glass cloth impregnated with epoxy resins by processing under heat and pressure. It owns the character of high temperature resistance, High-intensity, Flame-retardant grades to UL94-V0, high mechanical properties and dielectric properties, good heat resistance, good-smoothness, etc. If you require FR-4 Epoxy Sheet supplier, We has a wide variety at very reasonable prices to help. 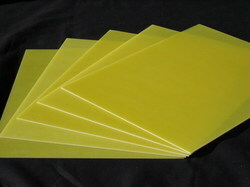 All the FR-4 Epoxy Resin sheets are guaranteed quality. We are importers of Flame Retardant Insulation Board. If you have any question, please feel free to contact us.